The Phoenix Country Club is working with a Developer to bring High Rise (H-R) High Density District zoning to a parking lot on 7th Street and Thomas which is outside of the city core, the Central corridor and even the Transit Overlay District. High Rise zoning allows for 250 feet of height. 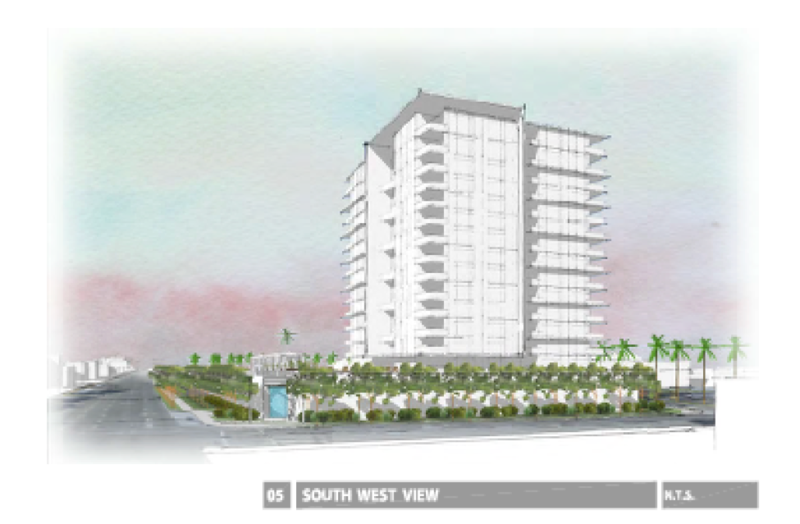 The Developer says it will stipulate to a maximum of only 175 feet for this project that will have 125 condominiums. We have seen how difficult it is to enforce or keep stipulations on other properties. Thanks to all for so much support!!!! OVER 900 Opposition Petitions Collected!!!! Thank you for signing! Thank you for making all the calls, sending the emails and attending so many meetings!!!! We had hundreds of you show up when we needed you the most!! WEARING A REALLY VISIBLE COLOR. Thank You to Mike Wallace for the great Red Looming Tower T-shits and the NO HIGH RISE street signs!!! Thank You to Jeanne Yawger's tireless efforts: emails, treats, calls, and, of course, the amazing lego creation that made Council members eyes bulge out when the true height of the tower was demonstrated in three dimensions (over all kinds of BS objections). Thank you for the huge corner STOP THE TOWER "campaign style" signs and Height = Blight. BUT WAIT, WHY THE THANKS: WHAT REALLY HAPPENED????? We thought you should hear it straight from us what happened yesterday, because there is a lot of misinformation going around. For instance, we have been contacted by people on both sides of this issue, about our win or our loss. (There is even one guy out there who felt the need to gloat about how the Club won to one team member). So you are dying to know what happened? Do you think you know because you read the Arizona Republic which wrote "Phoenix Approves Country Club condo 'tower' despite neighborhood concerns" or the Arizona Business Journal which wrote "Phoenix City Counsel unanimously voted against a controversial high rise zoning request— but left the door open for future discussions"? The Answer is: it depends on what YOU view as a win. As it was never our intent to force the Club to keep a poorly maintained parking lot on that corner, a win-loss-draw is actually not an easy thing to describe. What happened yesterday is complicated. Rather than voting on the application, the council voted on a lengthy motion modifying the application. 1) They did not get High-Rise zoning overlay (entitlement to 250 feet). 2) They did not get a zoning entitlement with a stipulation allowing for a 175 foot, 164 foot, 144 foot, or even a 125 foot tower: all heights they had demanded. 2) The M-R overlay has a stipulation limiting them to 110 feet. 3) There are a bunch of other stipulations we won't pretend to understand, but the Developer was ok with them, so they can't be a big deal. 4) The Developer will file another zoning application for a PUD rezoning case, where the max height is 110 feet and where there will be neighborhood involvement in design, but we think this is mostly so the Developer can cleanse the parts of the M-R overlay that are inconvenient to them from the property (M-R apparently requires a lot of open space). For us this rezoning case has always been about what property will be rezoned next. Did we bloody the richest and most powerful group of people in the City enough that other owners/developers of nearby property will not attempt the same High Rise nonsense outside the Central corridor? Only time will tell for sure, but I suspect that the people at all levels of the City, and the land use professionals in the community, would warn any newcomer looking at the zoning map that there be dragons here. This intersection has a Circle K, two empty buildings, and the Phoenix Country Club's "underutilized" parking lot (according to the Applicant), so it plainly does not one of the "few areas" that generates "exceptional amounts of activity of a commercial nature". The project also offers concrete walls along Thomas and 7th Street, and it turns it back and sits far away from the corner that the Developer claims it will be revitalizing. 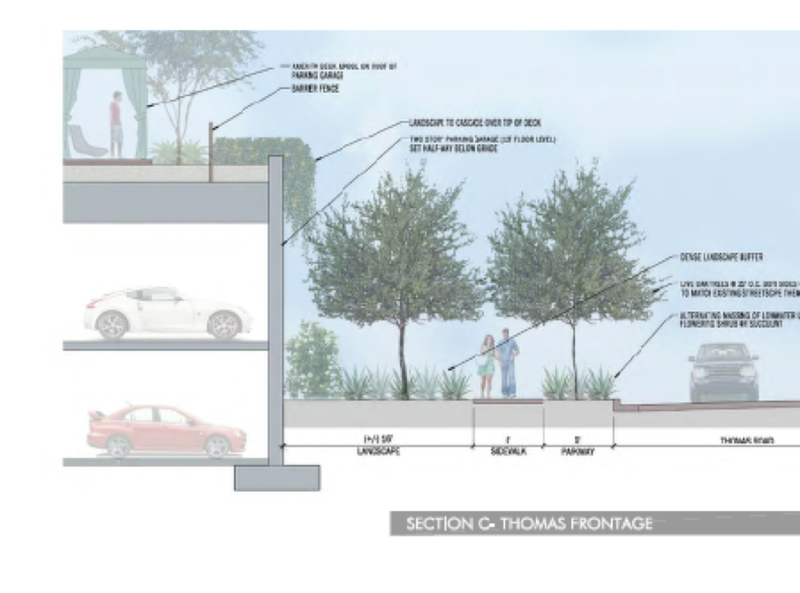 On Thomas and 7th Street, people will be offered a story and a half of a concrete wall that encloses the parking structure. The "green space" or "open space" is a party deck elevated over the mere pedestrian level of the street. Pass the Grey Poupon! The project claims to be "walkable" but its orientation and design demonstrate a hostility to the core principles of a walkable city: it has more parking spaces than mandated by the city code, its residents will have to walk around the entire building to use any mass transit option, and the High Rise tower is set far back from the corner of 7th Street and Thomas. This High Rise nothing more than another "Crystal Point" development that only seeks to benefit the Phoenix Country Club and the Developer, while ignoring basic design principles, decades of city planning, billions of dollars of investment into the light rail, and the valid concerns of neighbors who reasonably believed high rise development would be limited to the Central Corridor. While the Developer and the Phoenix Country Club seek a High Rise zoning entitlement handout from the City of Phoenix, that are contrary to the code provision allowing for a High Rise, the Phoenix Country Club continues to enjoy immunity from the 2.17% City of Phoenix's property tax on the golf course because the golf course is a "county island": property within the City of Phoenix but not part of the city. SavePhoenixHomes.com is an outreach effort on behalf of the neighborhood associations and hundreds of neighbors opposed to this too dense, too intense 175-foot tower. High Rise zoning will be harmful as it is to us, we believe this threatens EVERY Phoenix homeowner with bad rezoning precedent. We all rely on existing zoning to protect our family's investment, privacy, and ability to reside free from inappropriate density and incompatible height. The Phoenix City General Plan promises neighbors with a level certainty as to living in our great city. This proposal casts all such assurance of certainty into doubt and promises a proliferation of High Rise where ever a Developer thinks it can get financing.